The St. George Orthodox Church of Westchester is one of the thriving and vibrant parishes in the American Diocese of the Indian Orthodox Church. The origin of the parish was the result of the great need and the earnest yearnings of the members of the Church living in Westchester County of New York. The many members of our Church who were recent immigrants from India in the early 80's living in the New Rochelle-Port Chester area were looking for a place of worship where their spiritual and sacramental needs be fulfilled. The two parishes in the area were not able to accommodate any new members because of the limitations of space and membership restrictions. The then Diocesan Metropolitan, His Grace Thomas Mar Makarios, was aware of the needs of the members and as per his permission a congregation was formed with the assistance of the Rev Fr Dr. KC Mathews at the United Methodist Church in Ardsley in May 1985. The congregation continued to have services occasionally. A petition was submitted soon to the Metropolitan to approve the congregation as a parish. His Grace thru his order dated September 15, 1985 approved the request of the people, formed a new parish naming 'St George Orthodox Church of Westchester' and appointed Fr. George Koshy as the Vicar of the parish. After the formation, the parish started growing slowly and steadily. Membership was increased. The activities of the parish grew and the parish has become a dynamic force in the community and in the diocese due to the unity and cooperation among the members. The Malayalam School, Vidhya Bhavan, started by the parish was the first one by an Indian congregation in this country. The visits of His Holiness Baselius Mar Thoma Mathews II on many occasions, which the parish recollects with nostalgic feelings, and other prelates and leaders of the Church added new dimensions in the growth of the parish. One constant problem the parish faced since its inception was to find a convenient place for worship. The parish had to move from place to place. In many places, constrains of time and space bothered the community. 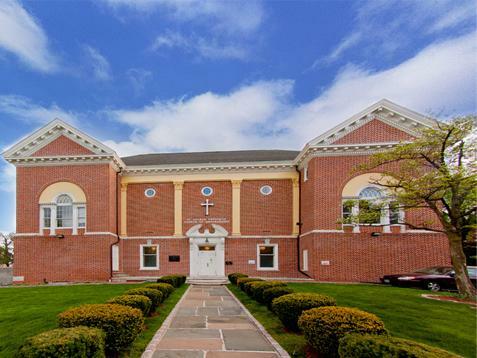 In this regard, the parish is indebted to St. Paul's Trinity Episcopal Church in New Rochelle for allowing its facilities to facilitate the needs of the community for a long period of time. The members of the parish were looking for a space of their own to fulfill their spiritual needs. The constant prayers were answered in 2005. The parish bought a convenient building with three floors in Port Chester (360 Irving Avenue). With the hard work of the parishioners the middle floor was converted into a chapel soon. On November 1, 2005, H G Mathews Mar Barnabas, the Diocesan Metropolitan, led the dedication service of the temporary chapel with the assistance of H.G Zacharias Mar Nicholavas and H.G Dr. Thomas Mar Athanasius (Kandanadu). The parish celebrated the feast of Parumala Thirumani at the same time. Many priests, deacons and members of the laity graced the function. The work for the new church on the top floor started soon. With Almighty God's abundant blessings coupled with the unlimited efforts, amazing cooperation and the unparalleled financial assistance of the members, the long cherished dream of a beautiful Church was fulfilled. The parish is thankful to sister parishes, individuals and families who encouraged and assisted us in fulfilling our dream. By July of 2007, the construction of the new church, its beautiful and heavenly Holy of Holies and the majestic Altar was completed. On the evening of July 22, 2006, His Holiness Baselius Mar Thoma Didimus 1 surprised the members thru his apostolic presence by visiting the parish, conducting the evening service and blessing the foundation stone soon to be laid under the Holy Altar. His Holiness was supposed to preside over the consecration ceremony of the new church, as planned in advance, but His Holiness was forced to cut short his visit to the United States due to unavoidable circumstances. The Consecration of the newly built church took place on July 28 & 29, 2006. The solemn ceremony was presided over by the Diocesan Metropolitan, H.G Mathews Mar Barnabas assisted by Metropolitans H. G Dr. Yuhanon Mar Meletius (Trichur), H. G Dr Zacharias Mar Theophilos (Malabar) and a large number of the members of the clergy. A warm reception was accorded to the Metropolitans when they arrived for the dedication. The consecration ceremony and other various colorful celebrations, including a public meeting and cultural program, were attended by many from far and near. The St. George parish family is unique in many ways. First and foremost, the Almighty God has been showering His blessings continuously upon the parish and it's members. One can see rarely so much cooperation and unity in a parish. Those who visit the parish become part of the parish family. Such a way guests are welcomed and treated in the parish. The tireless efforts and amazing physical and financial contributions on behalf of the parish prove clearly and loudly but humbly the members love for the parish and loyalty to the Church.